Today is an easy paced acclimatization day. 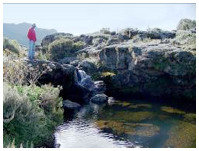 We will continue our hiking through streams, a river gorge and moorlands. 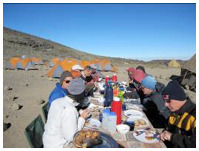 Camp is set a little higher on the Shira Plateau with expansive view of Kilimanjaro. There is an optional hike in the afternoon where you can enjoy the large scenecios and lobelias that grow at this elevation. We will spend the night at Shira Camp. 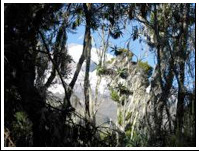 This camp offers a great view of the Kibo Peak. At this location which displays vast prairies and bushes, you will find them regrouped to face the cold and wind. At night, the sky is covered with thousands of stars and you can admire the famous Southern Cross and hear the distant cries of jackals. The next morning, you can not miss the presence of buffalos, or elands. be your first introduction to alpine zone where the only plant life is the heartiest of grass and lichens. You ascend through the moorlands to alpine desert zone. You will climb slowly. Barranco Camp, where we will spend the night, is located in a beautiful valley, with stunning views of Mount Meru, the twin volcano of Mount Kilimanjaro. You will also have the Heim glacier views, the southern slope of Kibo, not to mention the impressive Barranco Wall. be your first introduction to alpine zone where the only plant life is the heartiest of grass and lichens. You ascend through the moorlands to alpine desert zone. You will climb slowly. We will spend the night at Barafu camp, after a dinner cooked by our chef on site. 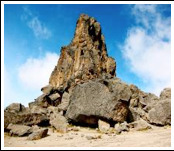 At midnight you will begin ascent to Uhuru Peak. You are going to complete some serious achievements and goals. Hiking from six to eight hours from the camp will bring your life into perspective, when you stand on the top of the highest free standing mountain in the world. The weather will tell you how long you are going to spend on the top of Africa for taking pictures and rolling up your trip. 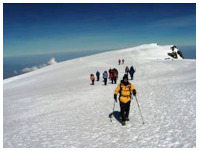 From the summit will take approximately three hours hike and have a short stop for lunch around Barafu camp. Later, to proceed and make to Mweka Camp where you are going to spend your last night on Kilimanjaro and have your victory celebration! You shall spend your last night on the conquered volcano, the majestic Mount Kilimanjaro at Mweka Camp, located more than 9,000’ (almost 3,000m) lower than the summit reached. It will be time to celebrate your victory with great satisfaction!